פורים (help·info) Pûrîm "lots") is a joyous Jewish holiday that commemorates the deliverance of the Persian Jews from the plot of the evil Haman, who sought to exterminate them, as recorded in the biblical Book of Esther. It is characterized by public recitation of the Book of Esther, mutual gifts of food and drink, charity to the poor, and a celebratory meal (Esther 9:22). Other customs include drinking wine, eating special pastries called hamantashen, dressing up in masks and costumes, and organizing carnivals and parties. ^ a b Mason, Steve (Aug 2009). "The Bible and Interpretation". www.bibleinterp.com. Retrieved Nov 19, 2018. ^ Jacobs, Louis (2007). "Judaism". In Fred Skolnik. Encyclopaedia Judaica. 11 (2d ed.). Farmington Hills, MI: Thomson Gale. p. 511. ISBN 978-0-02-865928-2. Judaism, the religion, philosophy, and way of life of the Jews. ^ Neusner, Jacob (2003). "Defining Judaism". In Neusner, Jacob; Avery-Peck, Alan. The Blackwell companion to Judaism. Blackwell. p. 3. ISBN 978-1-57718-059-3. Retrieved 22 August 2010. ^ Maimes, Steven (Jan 2013). "Is There a Jewish Theology or Not?". Retrieved Nov 19, 2018 – via ResearchGate. ^ Septimus, Daniel. "Must a Jew Believe in God?". My Jewish Learning. 70 / Faces Media. Retrieved Nov 19, 2018. ^ "Conservative Judaism". Jewlicious. 2005-06-16. We therefore understand this term as a metaphor to mean that the Torah is divine and that it reflects God's will. ^ Ariel, Yaakov (2006). "Judaism and Christianity Unite! 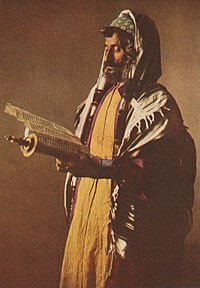 The Unique Culture of Messianic Judaism". In Gallagher, Eugene V.; Ashcraft, W. Michael. Jewish and Christian Traditions. Introduction to New and Alternative Religions in America. 2. Westport, CN: Greenwood Publishing Group. p. 191. ISBN 978-0-275-98714-5. LCCN 2006022954. OCLC 315689134. In the late 1960s and 1970s, both Jews and Christians in the United States were surprised to see the rise of a vigorous movement of Jewish Christians or Christian Jews. ^ Ariel, Yaakov (2006). "Judaism and Christianity Unite! The Unique Culture of Messianic Judaism". In Gallagher, Eugene V.; Ashcraft, W. Michael. Jewish and Christian Traditions. Introduction to New and Alternative Religions in America. 2. Westport, CN: Greenwood Publishing Group. p. 194. ISBN 978-0-275-98714-5. LCCN 2006022954. OCLC 315689134. The Rise of Messianic Judaism. In the first phase of the movement, during the early and mid-1970s, Jewish converts to Christianity established several congregations at their own initiative. Unlike the previous communities of Jewish Christians, Messianic Jewish congregations were largely independent of control from missionary societies or Christian denominations, even though they still wanted the acceptance of the larger evangelical community. ^ Ariel, Yaakov (2006). "Judaism and Christianity Unite! The Unique Culture of Messianic Judaism". In Gallagher, Eugene V.; Ashcraft, W. Michael. 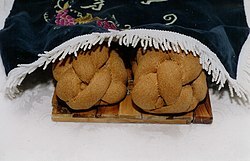 Jewish and Christian Traditions. Introduction to New and Alternative Religions in America. 2. Westport, CN: Greenwood Publishing Group. p. 191. ISBN 978-0-275-98714-5. LCCN 2006022954. OCLC 315689134. While Christianity started in the first century of the Common Era as a Jewish group, it quickly separated from Judaism and claimed to replace it; ever since the relationship between the two traditions has often been strained. But in the twentieth century groups of young Jews claimed that they had overcome the historical differences between the two religions and amalgamated Jewish identity and customs with the Christian faith. ^ Ariel, Yaakov (2006). "Judaism and Christianity Unite! The Unique Culture of Messianic Judaism". In Gallagher, Eugene V.; Ashcraft, W. Michael. Jewish and Christian Traditions. Introduction to New and Alternative Religions in America. 2. Westport, CN: Greenwood Publishing Group. pp. 194–195. ISBN 978-0-275-98714-5. LCCN 2006022954. OCLC 315689134. When the term resurfaced in Israel in the 1940s and 1950s, it designated all Jews who accepted Christianity in its Protestant evangelical form. Missionaries such as the Southern Baptist Robert Lindsey noted that for Israeli Jews, the term nozrim, "Christians" in Hebrew, meant, almost automatically, an alien, hostile religion. 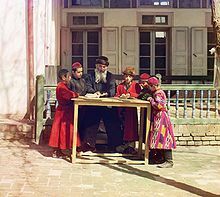 Because such a term made it nearly impossible to convince Jews that Christianity was their religion, missionaries sought a more neutral term, one that did not arouse negative feelings. They chose Meshichyim, Messianic, to overcome the suspicion and antagonism of the term nozrim. Meshichyim as a term also had the advantage of emphasizing messianism as a major component of the Christian evangelical belief that the missions and communities of Jewish converts to Christianity propagated. It conveyed the sense of a new, innovative religion rather that [sic] an old, unfavorable one. The term was used in reference to those Jews who accepted Jesus as their personal savior, and did not apply to Jews accepting Roman Catholicism who in Israel have called themselves Hebrew Christians. The term Messianic Judaism was adopted in the United States in the early 1970s by those converts to evangelical Christianity who advocated a more assertive attitude on the part of converts towards their Jewish roots and heritage.